Technology Consulting Overview | SSTC ONLINE | Scalable Systems Co., Ltd.
We provide supports to improve your visibilities in the market, which include not only guidance to enhance your websites and infrastructure for information transmission but also specific information content. We also help you with establishment and operation of facilities for application porting and system verification to drive your sales of systems. You can also receive training on programming as well as technical support for acceleration of programming. Please contact us any time for details and free estimation of following services we offer. Besides, we can also provide every service for document preparation including correction and translation. Regardless of size, “efforts to reach goals” have to be planned and accomplished as projects. An installation of system could go reasonably and could be concluded successfully, or could both lead to a dissatisfied result in terms of time, cost and quality, depending on sophisticated or poor project management. As customers are oriented toward successful managements, Scalable Systems supports to meet their various needs in their project management and system installation, as well as in technology-oriented system evaluation. 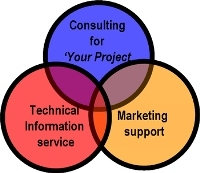 We mainly offer supports for pre-sales activities of customers in our consultation on project planning and practice, and continuously help them after installation of systems.